Black Friday, Cyber Monday, Giving Tuesday. Join us on Tuesday, November 27 for #GivingTuesday, a global day of giving that harnesses the collective power of individuals to celebrate generosity worldwide. 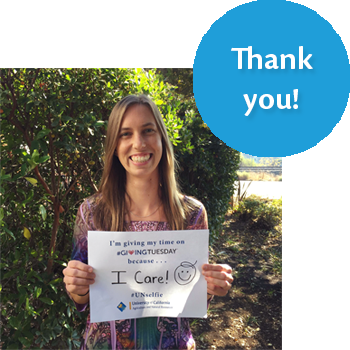 #GivingTuesday is held annually on the Tuesday after Thanksgiving (in the U.S.) Kick off the holiday season with us! What does it mean to be a #NeighborCA? In the midst of an ever-changing climate, it’s easy to be frustrated and overwhelmed—to feel helpless without knowing what to do next. But, there is something we can do—together, as neighbors, we can help our communities and heal the land around us. 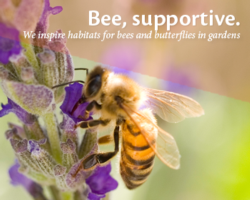 Your gifts allow UC Master Gardener volunteers to be the most reliable source of high quality research-based gardening information in California. 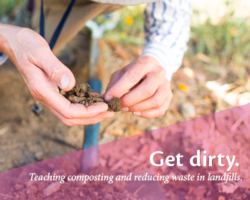 The UC Master Gardener Program offers its services at no cost to local communities, connecting concerned citizens and home gardeners to research and information directly from the University of California. With your support, we invest in research, education, and services in your community—to be a neighbor in times of need. And, we can’t do this without your help. #GivingTuesday is a movement about ordinary people coming together to do extraordinary things. 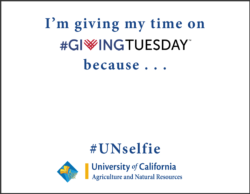 Whether you choose to donate your time or money this year for #GivingTuesday the UC Master Gardener Program would like to say thank you for helping make a difference! Share your story! Social media is key to making sure the story of the UC Master Gardener Program grows and reaches new audiences. 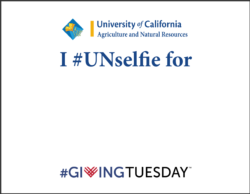 Download the #UNselfie posters above and share with us, your friends and your family what inspired you to donate. 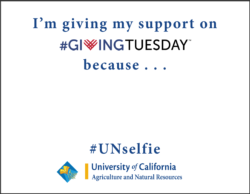 Remember to use the hashtags #GivingTuesday and #UNselfie!